Dermot and Meta Cantillon scored a major home-run this last month, when their eldest son, Jack, was a joint winner at the annual Martin Wills Racing Writing Awards. Dermot is the manager for the Smurfitt family and continues to serve the racing and breeding industries in many other ways. 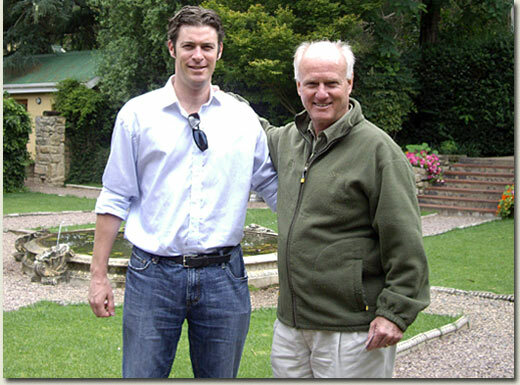 Together with his wife Meta, he owns Tinnakill House Stud in County Laois, which they established in 2002. 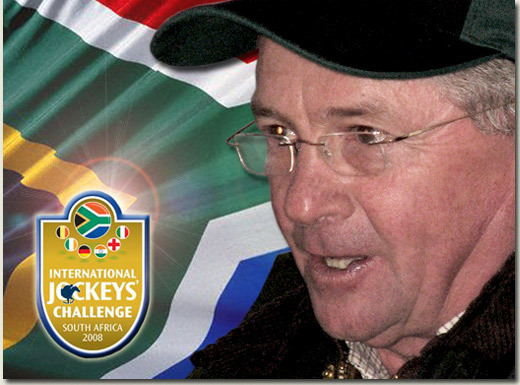 Michael Clower South African Bloodstock NewsIn the long history of the world’s bloodstock industry few men have been able to turn the market. The qualities required for this include immense drive, an inspired imagination and a dedicated determination to succeed no matter how insuperable the obstacles appear. Not many people are blessed with all these attributes, and the bloodstock industry has only a small pool to draw on. A number of its people have tried to buck impossible-looking trends over the years but few have succeeded. However Mick Goss joined the elite band at Gosforth Park on the first Sunday in November. 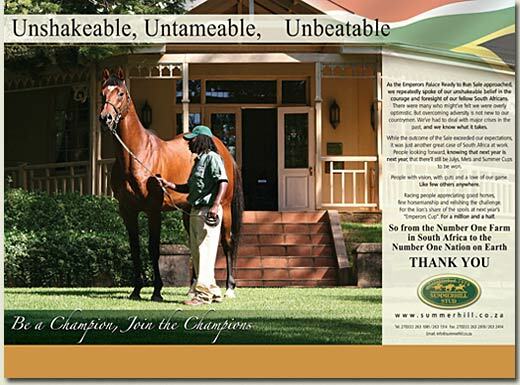 The Summerhill Stud boss has been the main driving force behind the success of the Emperors Palace Ready To Run Sale since its inception but, with thoroughbred sales round the world reeling under the impact of the global credit crunch, few expected the TBA’s fastest-rising sale to emerge unscathed. Many were steeling themselves for a 20% drop yet Mick Goss kept up his artillery of relentless promotion as if, like a modern-day Napoleon, he was simply not going to allow defeat to enter his calculations. His boundless enthusiasm paid off with a 34% rise in the average price and a sense of well-being that spread through the country’s studs as if it was manna from heaven. It was a grand catalogue and there is no doubt that it read a good deal stronger than in previous years. There is still improvement to be made before the overall level reaches that of the National Yearling Sale and, if this can be achieved, there is every reason for the graph to continue to climb. A new Ready To Run record top price was set when Basil Marcus went to R2,2million for an Australian-bred colt by seven-time Group One winner Rock Of Gibraltar (sire of Eagle Mountain) from a strong American family. Basil Marcus was acting for Denis and Gael Evans, Johannesburg-based owners who “have a lot of young horses with me.” Their sale-topper had been purchased eight months earlier for A$75,000 (approximately R500,000) at the Inglis Melbourne Premier Yearling Sale. 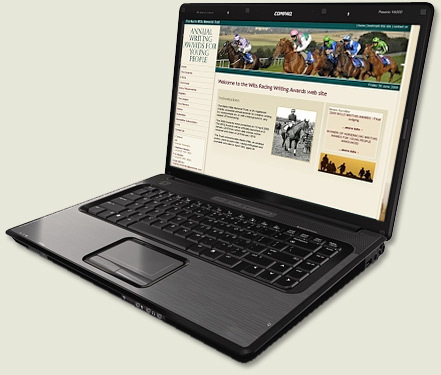 As last year, Australian-breds sold well and they accounted for four of the top seven prices. Marlon Aronstam’s two Brazilian imports also fared well. Oscar Pistorius’ decision to get involved could have far-reaching benefits for racing and breeding. The brilliant athlete bought the Kahal filly Watchful for R200,000 and is involved in the syndicate that purchased the second-highest priced lot, the Galileo filly Insasa, for R1,5million. Mike Azzie will train both. There is a close correlation between the athletics track and the racetrack and, if either of these two fillies do well, racing will be propelled into the limelight, other stars will see the appeal of owning racehorses and the public will want to go and watch. The once proud country of Zimbabwe took another tragic step this weekend, with the passing of the newly-installed Prime Minster, Morgan Tsvangirai’s wife following a head-on collision. There’s all sorts of speculation in the press as to whether this was contrived or pure accident, and that debate, no doubt, will rage for some time yet. Meanwhile, we had the pleasure of a visit from an ex-Zimbabwean in the form of legendary bloodstocker, Robin Bruss and his wife, Jane, this weekend, and Robin told us he won a race in Zimbabwe last weekend worth Z$50 trillion to the winner. As the cash is almost worthless, owners are allowed to trade the prize money for petrol coupons, which Robin is unlikely to be able to use in the foreseeable future. Talk about racing for the love of the game. Hats off to the Zimbos – they’d race in hell if they had to! He gave us a Z$10 trillion note, which he tells us would scarcely buy us a newspaper today, notwithstanding the fact they’ve already taken 12 zeros off the amount already. Ironically, the note is adorned with two of Africa’s most sacred emblems, one the rocks of the Matopos Hills (which enchanted Cecil John Rhodes to the point that he insisted on being buried there,) and the ruins of Great Zimbabwe, a poignant reminder of an earlier phenomenal civilization. Alongside the picture of Great Zimbabwe is an almost tragic depiction of the Reserve Bank of that country, a fine edifice by any modern standards, yet one which has presided over a currency which has quite the worst history of any currency anywhere. Could this be "Die Groot Trek"? Riding legend Michael Roberts and his wife Verna were diners at Hartford the same day. 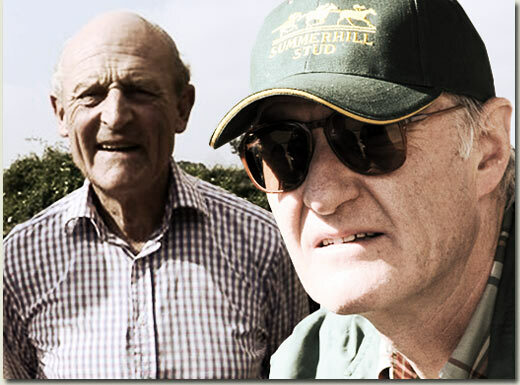 Summerhill stalwart Steve Sturlese was accompanied by his racing manager, Peter de Marigny and his newly acquired son-in-law, top jockey Brandon Lerena, whilst shipping supremo, Brian Roux, Arthur and Vynette van der Heijden and Standard Bank will all have darkened the portals of the farm before the week is out. Megan RomeynTuesday at Kenilworth saw the rise to form of Summerhill 2007 National Yearling Sales Graduate Maliyakhe, when he ran out a comfortable winner in the Avant-Guard Maiden Plate over 1200m. Following two places from two races, jockey Karl Neisus and his mount sealed the deal by powering to an impressive two length victory over runner-up, Ubizo. 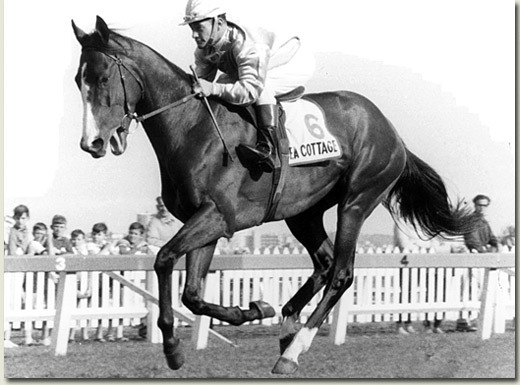 Maliyakhe is a son of Muhtafal out of the Northern Guest mare, Snooty Lady, who is in turn an own sister to J&B Met winner, Angus. Maliyakhe is the full brother to undoubtedly one of the land’s most promising three-year-olds of 2008, Lostintranslation, who died tragically last year following a severe bout of Laminitis. 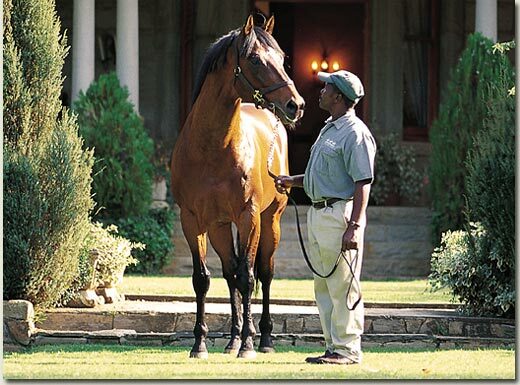 Snooty Lady is owned by old friends of the farm, Messers Rodney Thorpe and Roger Zeeman.